The WorkEZ PROFESSIONAL Silver - is a Ergonomic compact, multi-functional laptop desk and stand. 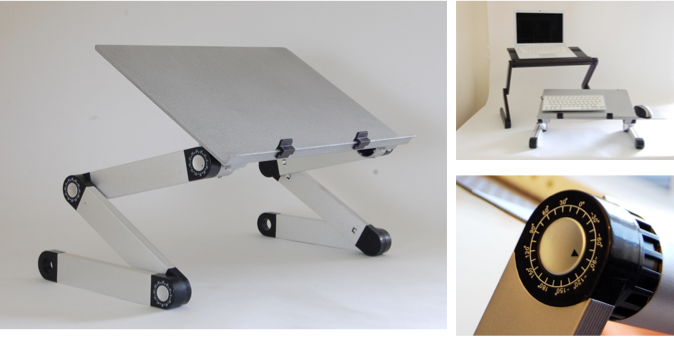 An incredible stand that holds laptops, tablets, monitors & books just about everywhere! Computing never felt this good! The Perfect Lap Desk for Slimmer Folks! Gets your computer off your lap & keeps it cool. Easily adjust the screen to the perfect viewing angle! Slips over your lap so you can move your legs around freely. Stand Up & Get Healthy! Convert any desk or table into a laptop standing desk. Elevate the panel to any height - up to 18"! Professional supports books, tablets, iPads, monitors, e-Readers and just about anything else under 13lbs. Panel Size = 16" by 11"
Folded Size = 19" by 11" by 2"